The cost of registering a single domain is approximately £10 for two years. With the rise of data science and the widespread use of tools such as R, Python and Matlab, programming has moved from the domain of computing scientist to users who have no formal training. Coupled with this, is the vast amount of additional free packages available. For example, R has over 12,000 packages on its main repository CRAN. These packages cover everything from clinical trials to machine learning. Installation of these packages does not go through a traditional IT approach, where a user contacts their IT officer asking for packages to be installed. Instead, users simply install the required packages on their own machine. Crucially, to install these packages does not require admin rights. This shift from a centrally managed IT infrastructure to a user-centred approach can be difficult to manage. We now regularly perform Shiny and R related security health checks. Contact us if you want further details. To make this article concrete, while simultaneously not overstepping the ethical bounds, we used URL hijacking to target Bioconductor. The Bioconductor project provides tools for the analysis and understanding of high-throughput genomic data. The project uses the R programming language and has over 1,300 associated R packages. Bioconductor has a large user community. The typical Bioconductor user is analysing cutting-edge biological datasets and therefore likely to be in a University, pharmaceutical company, or government agency. Their data is almost certainly sensitive, which could include patient data or results on upcoming drug trials. Each domain name is a simple misspelling of bioconductor. indicates R version 3.4.2 on a Windows machine. The machine’s location (IP address) is also passed to the server. Whenever a machine accesses a domain, this information is automatically recorded. For each of the eleven domains, we monitored the server logs for occurrences of the R user-agent. Whenever anyone accessed our rogue domains we always returned a 404 (not found) error message. It is worth noting that while SSL (https) is essential for a secure connection, in this scenario it just provides a secure connection to the rogue domain, i.e. it does not offer any additional protection. We monitored the eleven domains for five months, starting in January 2018. As expected some domains are clearly more popular than others. The top three domains, bioconducor.org, biconductor.org and biocondutor.org accounted for most of the traffic. No. 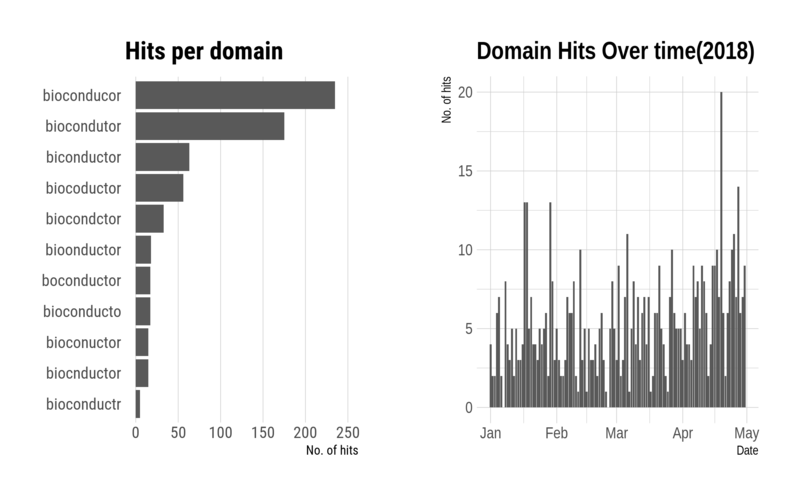 of unique hits per day, per domain over the five-month monitoring period. To avoid duplication, a particular IP address is only counted once per day. Only hits that had the R-user agent are counted. Is it really a big deal? Once the user has executed our R script, we are free to run any R commands we wish. If the attacker has targeted users installing Bioconductor then they would probably look for commercially sensitive material. This package provides functionality for uploading files to external web-servers. A more nefarious technique would be to detect if Dropbox or other cloud storage system is on their system and leverage that via an associated R package. An attacker could either upload all files or cherry-pick particular directories, such as those that contain security credentials, e.g. ssh keys. With approximately three lines of standard R code the attacker we could upload all files from a user’s home area to an external server. please be patient. Sorry for your inconvenience. would give the attacker more time. A sophisticated variation would be to delay file uploads until the user is away from the computer, while simultaneously installing Bioconductor and allowing the user to proceed as normal. The server detects an R user agent and returns R code. However visiting the site via a browser, such as Internet Explorer, will result in a “page not found”. An attacker could also cache IP addresses of visitors. This would enable them to launch an attack the first time a user visits the page, but all subsequent visits result in a redirect to the correct Bioconductor site. As with the mechanism employed by Bioconductor, there is nothing wrong with this particular method for package installation. However like Bioconductor, as there are many users installing the package in this manner, it would be relatively simple to register a similar username; we have actually registered the username tidyversee but didn’t create a ggplot2 repository. While the tidyverse repository is one of the most popular GitHub repositories, it would be relatively easy to script an attack on all packages hosted in GitHub. Creating similar user-names and cloning the targeted repositories, would create thousands of possible attack vectors. This security vulnerability is implicitly present whenever a user installs packages or libraries. For example in Python, users can install packages via the popular _pip__ package. However, a malicious attacker can upload a python package to this repository with a similar name to a current package and thereby gain control of a users system via URL hijacking. One of our main tasks at Jumping Rivers is to help set up R infrastructure and perform R related security health checks. If you need advice or help, please contact us for further details. What R version do you really need for a package? R Packages: Are we too trusting?